The same school children who said they wanted something done to save their lives, don't like the beefed up security at their school. The security which includes check points and having to use clear backpacks has the children there very unhappy. Now the kids say that they feel like they're in prison instead of school. Some are saying that they are being treated worse than livestock because of the metal street barricades. Basically, they are not happy with the results of their protests. 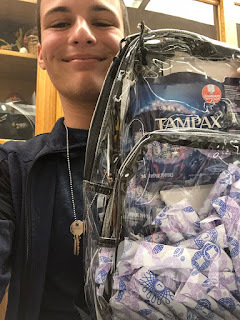 Some of the same leaders of the "March For Our Lives" protest that took place recently showed their lack of maturity by filling their now mandatory clear backpacks with tampons in an effort to say that their privacy is being infringed upon. 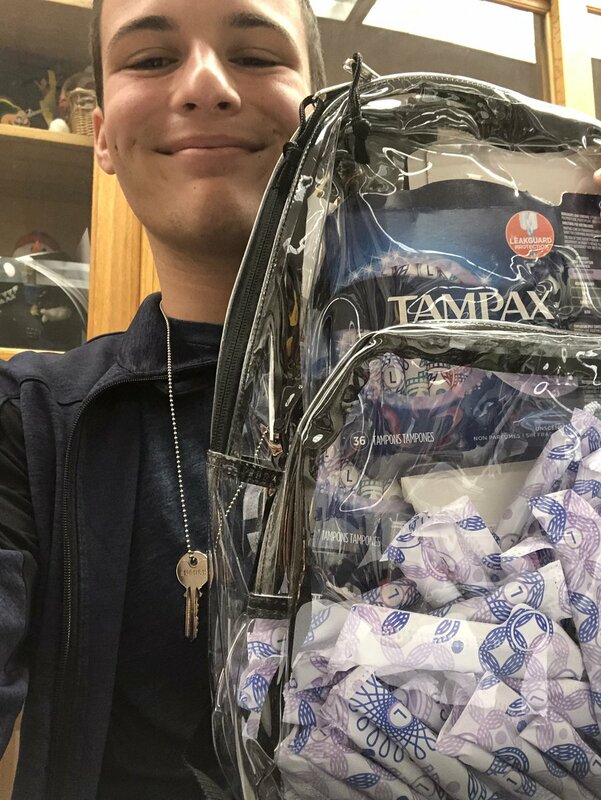 Of course why a High School boy in Florida would have tampons in his backpack is a question for others to answer, that's not for me to guess about the habits of High School boys in Parkland, Florida. Never mind that the clear backpacks were made mandatory after knives were found to have been smuggled into the school. Never mind that this is just a step in providing them more security. And as for the irony of these children are now protesting the security there school is providing, never mind that this is what they themselves demanded during their protests. Many now realize that their demands for security and to live was all a fraud. It's being said that they didn't want to be safe and secure, and that all they really wanted was to get political and ban guns. That they wanted a type of rifle taken away from every American gun owner because they knew what was good for all of us. And frankly, that makes sense to me since I believe that they were told that the problem was the AR-15 rifle that the killer used. Not the killer or his mental state or the lax security, but the AR-15 rifle itself. Some say those kids drank the Kool-Aid and followed the Liberal Left as if the Democrat Party, George Soros, Nancy Pelosi, and Charles Schumer, were all Pied Pipers. They screamed for gun control under the guise that they were interested in saving lives and being secure. It was all just a lie. Yes, a complete fraud. They had no interest in being secure. They only wanted gun control, a gun ban, and the repeal of the 2nd Amendment of the Constitution. Bravo to the Liberals who convinced those children that a piece of machinery, a rifle called an AR-15, was the problem instead of focusing on the root cause which was the killer himself. Bravo to those ignorant individuals who influenced children to accept the lie that a tool, a gun, a rifle, specifically an AR-15, somehow grew legs and assaulted that school in February. Thankfully the idea of being safe and banning a single type of rifle and calling it good is not how it works in life. Thankfully there are adults in Parkland Florida who don't see waiting for a gun ban of a single style of rifle as a sane and practical alternative to keeping children safe. What those children want will not keep anyone alive and well. The reason is that wanting a ban, which may or may not ever take effect again, will not provide an once of security for them. Whether the children like or not, even if it were possible to take away every one of the millions of AR-15 rifles in the entire world, that in itself would do nothing to ensure that someone does not attempt to harm students in some way with some other weapon. How do I know that? How am I so sure of that? Since it was authorized for sale to civilians in 1964, there have been a number of school shootings yet only two were committed using AR-15 rifles. All of the rest were done with shotguns, semi-automatic rifles, lever action rifles, bolt action rifles, handguns, knives, etc, and so on. Since these students in the Parkland, Florida, school are not mature enough, responsible enough, nor knowledgeable enough to buy a firearm, what makes anyone in their right mind think they are mature enough or experienced enough to know what they need in the way of security measures? What professional training or even experience have they had that says they are now experts on guns or security needs? No, being near where a crime takes place does not make anyone a gun expert nor a security professional. They simply don't know what it takes to stay secure in the way that they demanded they be protected. The victims of the Parkland shooting are those who were killed and wounded. The victims were not those who were led away safely by wonderful caring teachers. The killer was the man who showed up and did the killing, who did the harm, who did the act. The killer was not the gun he used. Sadly, the children there are not talking about the killer for one reason or another. Some say they don't want to face the fact that they are partly responsible for making Cruz want to come back to that school and do such a horrid thing. Some say it's simply easier to blame a rifle and not the user. Security doesn't work that way. A good security evaluation cannot pick and choose what it wants to look at and what it doesn't want to look at. In a good security evaluation, everything needs to be examined. Yes, that means access, identification methods, property being brought in and out by way of the kids and the adults, and among other things that means looking at vulnerable areas including the possibility of threats by the students and administrators themselves. People don't talk about it much for one reason or another, but the fact is that there have been a number of school shootings where adults have entered the school for no apparent reason to shoot people there. And yes, there have also been killers who were part of the school staff here and there. We tend to think of school shooting as guns doing the killing. But the fact is, most school shooting are kids killing other kids. That's simply more the case. And of course, to keep as many people as safe as possible against the possibility of an attack, measures limiting access and ensuring weapons are not brought on campus need to be taken. We've already talked about how the school discovered knives and other weapons being brought into the schools, so not the are having the kids use clear backpacks. With the metal detectors, check points and barriers, these are all good first steps in providing the kids with good security. Next, the school may want to limit access to areas formerly open to all. Areas need to be placed off limits or used with a pass system. The schools there need to get Identification Cards and update information as to who is forbidden from entering the school grounds. Access lists need to be updated and measures need to be changed periodically so that returning students have a hard time coming back to reek havoc on those that they have problems with. In the case of the February 14th shooting, the killer was a former student who knew exactly what the security measures were. Subsequently he was able to gain entry and find his targets fairly easily. The most controversial aspect of securing schools is that the schools may want to have students undergo and clear background checks. Especially right now before returning to school there. High School kids with felonies may not want to be allowed back on campus. And since these days children are routinely being provided with an array of medications that have a number of side-effects including rage and suicidal tendencies, finding out who is on medications and for what reason would be helpful information when looking at students as potential threats. And like it or not, since students are killing other students, they need to be looked at more as a threat than mere children these days. Since no one knows what is the exact intent of those sick individuals who act out to harm others, precautionary discussions with troublemakers and rebellious students are sometimes carried out. As stated before, to keep all as safe as possible against any attack, measures have to be taken limiting access and ensuring weapons are not brought on campus. So to allow questionable children on campus may be a problem when it comes to limiting access of a potential threat. If maintaining peace and the health and welfare of others there is the objective, then the behavior and history of some students needs to be looked at. I've read where some inner-city schools actually request psychological examinations of female students who shave their heads, boys who identify themselves as transgender, and gays who appear violent or self-destructive. Besides psychological testing, those individuals are assessed for anger issues and questioned as to whether or not they have violent thoughts toward others. Since not everyone sees a gay youngster as being normal, other kids may have problems with their choice of "self-identifying" as something other than what they are. This can lead to conflicts and should be known to administrators. Also, students who declare themselves "Leftist" or some sort of extremists who worship and celebrate mass murderers such as Che Guevara by wearing t-shirts with his image and others are at times questioned. Students who agree with the Communist tactics of Stalin and Mao who exterminated millions of their political opponents are talked with. These students may see others who love America and our Capitalist system as enemies. They therefore may see others as potentially future targets. Knowing how violent ANTIFA has been, no one should rule out an ANTIFA member in school. This is especially true if they feel the need to act out their aggression toward anything not in agreement with their ultra-Liberal or Leftist political philosophy. During any security evaluation, deviant behavior such as glorifying mass murderers such as Che Guevara or the Aurora Colorado theater killer for example may be red flags of violent intentions. Red flags that are no different than finding out that a child spends a great deal of time watching violent videos, has an unhealthy obsession with death, studies how to built bombs, or is consumed with how to use weapons to commit a crime. As for those who say that these measures are extreme? Let's remember that during their "March For Our Lives," the children protested and demanded that adults do what's needed to save their lives. After all, they said the loss of just one child is too much. I agree and the responsibility for their security sits with the School Districts. While the Parkland, Florida, children say they would rather remain defenseless against an armed intruder and not arm their administrators, other schools across the nation have ignored the wishes of naive children and did what was needed to confront a threat. The result is that many lives have been saved doing so across the nation. We don't hear about guns in the hands of administrators or a school officer because that would be counter productive to the gun control agenda. As for the measures that I mention above, schools in the inner city have had many of those measure already instituted for years now. The schools in Parkland, Florida, should do the same to provide the security needed to prevent another mass murder from taking place. While schools in general need to stop being "soft-targets" as a result of lax security, the schools in Parkland need to do what they can simply because they have learned that they cannot depend on their Sheriffs Department to act when needed. Schools need to act even if it ruffles a few feathers of children who are now feeling indignant about the security that's being provided to them. Whether students are unhappy or not should not be a concern to administrators. The concern school administrators should be to never again have to explain to another parent how they didn't do enough to keep their child safe.